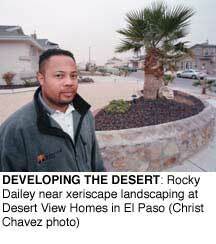 EL PASO, Texas - Rocky Dailey sells homes on the outskirts of town, out where the highway disappears into creosote bush and "for sale" signs dot the land. Billboards welcome residents home to desert communities with names like "Las Palmas" and "Oasis Ranch." "It's the friendliest city in Texas," Dailey tells prospective buyers in his real estate office at Desert View Homes. Out here, the eastern frontier sparkles like gold for developers. El Paso's population is expected to double within 20 years. Its sister city, Mexico's Ciudad Juarez, is expected to double as well, as the burgeoning maquiladora industry, ignited by the 1994 North American Free Trade Agreement (NAFTA), draws thousands of new workers every year. By 2020, the population of this sprawling border metropolis could hit 4.5 million. "There's no way you can stop a city from growing," says Dailey, glancing out the window over an army of lawns and rooftops to the jagged, golden-brown mountains beyond. This is truly a "desert view;" just seven inches of rain fall here each year. But ask this native El Pasoan if he worries about providing water to his new suburbs and he's nonchalant. "We'll have as much water as we can, until it runs out." The water is running out. Here, where the Rio Grande first enters Texas from New Mexico and its calm flow becomes the turbulent international divide, a water crisis is brewing. More than 2 million thirsty urban residents, along with industry and agriculture, are sucking dry their main water source, an underground aquifer called the Hueco Bolson, which stretches beneath the border. Some experts predict El Paso will deplete its fresh groundwater by 2025. Juarez could hit the bottom of the bolson even sooner. "We're starting to bump up against the ceiling," says Ed Hamlyn, with the Center for Environmental Resource Management at the University of Texas at El Paso (UTEP). 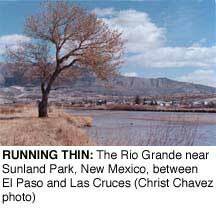 The obvious alternative to groundwater meanders right past the two cities' front stoops: the Rio Grande. Yet the river is already stretched thin. The Rio Grande rises in Colorado's San Juan Mountains, where it is immediately plumbed and put to work, watering fields of hay and potatoes in the San Luis Valley. In northern New Mexico, its water feeds into acequias, irrigation ditches built by early Spanish settlers. And south of Albuquerque, in the Middle Valley, the river irrigates chilies, cotton, alfalfa and pecans, even as environmentalists fight to save some of its water for the endangered silvery minnow and the riverside forest, or bosque (HCN, 10/11/99: A tiny fish cracks New Mexico's water establishment). By the time it reaches southern New Mexico, the Rio Grande has been so pinched and drained that it has almost ceased to be a river. In the Hatch and Mesilla valleys, people call it a canal. The bosque has been clear-cut and the river straightened and hemmed in between levees. Each winter, it is turned off like a garden hose. Any attempt to save some water for wildlife, or for the river's sake, is seen as an attempt to steal water that belongs to American farmers and cities or to Mexico. On the border, the river provides nearly half of El Paso's municipal water and irrigates fields on the outskirts of Juarez. The little water that makes it past El Paso and Juarez goes to farmers, who usually divert the last drops at Fort Quitman, Texas. Below Fort Quitman, the Rio Grande runs virtually dry for 200 miles, until it is met and replenished by Mexico's Rio Conchos. So the overtaxed Rio Grande provides no easy solution to the water needs of El Paso, Juarez and the millions of people who live along the border. This isolated stretch of land is turning into a nation of sorts, strongly attached to neither Mexico or the U.S., existing under laws of its own. So far, those laws have not come to bear on the border's booming cities. The multinational corporations that profit from the maquiladoras invest little in the local communities. But now, there's a glimmer of hope, both for border residents and the river that runs between them. On the El Paso side, the demand for more domestic water may break the farmers' hold on it, and actually return some water year-round to a dead stretch of the river. While Juarez has been reluctant to deal with its own looming water crisis, there, too, officials are waking up to the needs of the masses now living without running water or sewers. Is the border beginning to mature at last? Will its growing pains and the human misery that has attended them lead to investment in community, and care for the river that gave rise to it? The border cities' dilemma becomes starkly clear as you follow Interstate 25 south across the desert from New Mexico. One of the first signs that you're getting close to El Paso is a water slide perched atop a hill by the highway. Like the oceans of lawns that surround El Paso's homes, it raises the question: Why such lavish use of water in a desert? El Paso sits on the banks of the Rio Grande, but the city's real water wealth has been underground. Until roughly 2 million years ago, the Rio Grande ended here, emptying into a huge inland lake not unlike today's Great Salt Lake in Utah. The water evaporated or seeped into the sandy ground, creating the Hueco Bolson. In the 1950s, when drought hit the Southwest, rivers dropped and farmers in New Mexico and Texas watched their crops wither and die. But El Paso, which pulled most of its water from the ground, boomed along with Sunbelt cities such as Phoenix, Ariz., and Albuquerque, N.M. Green lawns spread across the desert and water-hungry garment factories set up shop. As early as the 1970s, however, El Paso realized the bolson wasn't bottomless. By 1980, the city was exploring other water sources. And in 1990, U.S. Geological Survey scientists added to the urgency when they predicted that at the rate El Paso was going, it would tap all its fresh water within 25 years. In the decade that followed, El Paso began to wean itself from the Hueco Bolson. It turned to the Rio Grande, and the farmers that control it. The city began buying up farmland and convincing farmers to lease their water. Ten years ago, El Paso pulled 85 percent of its municipal water from the Hueco Bolson. Today, the city gets 40 percent of its water from the Hueco Bolson and 45 percent from the Rio Grande. The remaining 15 percent comes from wells northwest of town that tap another aquifer, the Mesilla Bolson. El Paso also got aggressive about conservation, with some dramatic success, says David Brosman, chief operations officer with El Paso Water Utilities. It revised its rate system, so that the more water residents use, the more they pay. It instigated new rules on when people could water lawns, asked that they wash cars with buckets rather than hoses, and issued tickets to water wasters. It gave rebates for low-flush toilets and handed out 147,000 free low-flow shower heads. The city now pays people by the square foot to dig up their lawns and replace them with drought-tolerant desert plants. An ordinance requiring developers to landscape with desert plants, however, is meeting resistance. In 10 years, El Paso has knocked down its per capita water use almost 21 percent, to 159 gallons per day, compared to 229 gallons a day in Phoenix and 209 in Albuquerque. Today, despite population growth, the city uses about the same amount of water that it did a decade ago, says Brosman. But, he adds, "We're running out of conservation." What are El Paso's options? Officials have considered building a desalination plant, to clean salty water from deep in the aquifer, or perhaps the first-of-its-kind "toilet-to-tap" water-treatment plant. Both options are expensive, however, and Brosman notes that "a lot of people are pretty skittish" about drinking treated sewer water. 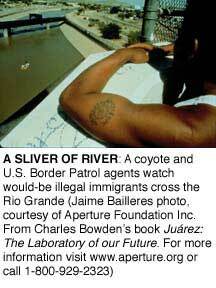 So all eyes are on the Rio Grande, and the river water still used to irrigate fields outside the city. "We need to rely more on the river," says Brosman. "Agriculture brings in only $60 million a year in El Paso County. When you look at the highest and best use of the water, municipal and industrial use is many times greater." Across the Rio Grande in Juarez, the problem is even more acute. Every year, Juarez's pumps plunge deeper into the Hueco Bolson. Mexico's entire allotment of Rio Grande water goes to farmers, so the city pumps groundwater year-round at full force. At that rate, U.S. experts warn, Juarez will exhaust its fresh groundwater within just five years. Already, several pumps have begun to pull up water too salty to drink. Meanwhile, the demand for drinking water is only increasing. NAFTA sent many American corporations across the border to Juarez, where they enjoy tax breaks and less stringent environmental regulations and labor laws. Juarez now houses 300-400 maquiladoras, factories owned by companies such as Delphi, General Electric, RCA and Sony. The maquiladoras have sparked a population boom in Juarez, where workers can earn $5 to $7 a day - twice what they could make elsewhere in Mexico. Some 60,000 new people arrive each year. But critics say the city has sold itself to industry without adequate infrastructure for industry's lifeblood: the workers. Estolia Villareal is among hundreds of thousands of Juarez residents living without water. Villareal arrived in Juarez 10 years ago from farther south, in the state of Durango, and set up home on a hill that doubles as the city garbage dump. The air there is sour; in the summer, steam rises from the debris. Villareal's days start at 3 a.m. A blue plastic bucket in hand, she steps through the front door of the cramped concrete house where she lives with her husband, three of her children and several grandkids. Opening a faucet in the yard, she waits. Soon a light stream of water flows, tipping her bucket. Two years ago, desperate for water, Villareal and her neighbors hooked up this hidden hose to the city water system. The system is unreliable, however; the tap produces water just a few hours a day. The only other water they receive comes every eight days, when city water trucks labor up the hill to fill 55-gallon drums. That water, though precious for washing, is not safe to drink. Industry recruiters "come to the south promising paradise, work, a good life here," says Villareal. "We don't know what it's like until we get here." Nor do they know about the endangered aquifer, or that their ever-growing population on the hills exacerbates Juarez's water crisis, says Humberto Uranga, spokesman for the Juarez Water Commission. "Half the city grew by unregulated invasion," he says. "That is what the maquila brought here. The promoters of the maquiladora industry don't take water into account." Maquiladora officials reply that their plants use just 10 to 15 percent of the city's water. But that figure doesn't include the water consumed by their workers. Experts say Juarez's maquiladora industry will employ 251,740 people by 2002, nearly double the number before NAFTA. Future plans to quench their thirst are hazy in a city that only last year installed its second wastewater treatment plant. More than 200,000 residents still lack sewer line hookups. What's more, Juarez water officials disagree with the U.S. studies that predict their water will run out within five years - a fundamental difference that has kept the two sides from collaborating more closely. "The life of the aquifer can't be measured. It can only be speculated," says Edmundo Urrutia, a water specialist at the Juarez Water Commission. "Our goal is that the Hueco Bolson lasts as long as possible." 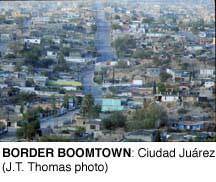 In recent months, however, Juarez officials have started to show signs of concern. There's talk of tapping Mexico's side of the Mesilla Bolson as well as more distant aquifers. But piping in water and repairing the existing water system could cost $800 million over a 20-year period. NAFTA actually set up a bank to fund projects such as these. Together, the U.S. and Mexico have put $450 million into the North American Development Bank, or NADBank. The money is meant to protect the border environment and workers by funding water and sewer lines and solid waste projects. But to date, NADBank has loaned out only a fraction of that money, so Uranga is looking to the World Bank, the Mexican government and private investors. Even in the best case scenario, he says, the new projects won't get off the ground for five years. So Juarez, too, is turning to the Rio Grande. Under a 1906 treaty with the U.S., says Uranga, Mexico is guaranteed 60,000 acre-feet of river water - enough to supply Juarez's present population for half the year. Taking more water from the Rio Grande will not be easy for either Juarez or El Paso. In the coming weeks, Juarez officials will release a plan to use more river water. "What the city wants is to take the river water and use it for residents," says Uranga, "and then give the farmers back treated water from the treatment plants." On the surface, it looks like Mexican water law will make that plan easy. The Mexican Constitution declares that water belongs to the people; water rights are not the property of farmers or irrigation districts, as they are in the U.S.
"In theory, officials in Mexico City, with a stroke of a pen, could take that (water) away" and give it to Juarez, says UTEP's Ed Hamlyn. "In practice, though, farmers control the water. Water is not something you can buy or sell, so they resist anything that could take it out of their hands. It creates a lot of inertia." The city's plan is sure to meet resistance from farmers like Lorenzo Gutierrez, who once grew melons and corn in Saragoza, a valley southeast of Juarez. When Juarez's second wastewater treatment plant opened last year, just a few miles from Gutierrez's home, city officials promised farmers treated wastewater from the maquiladoras. Farmers say the treated water hurts more than it helps. "The water used to be good," Gutierrez says, a Nike USA baseball cap tucked down to shield his eyes from the sun. "Now it burns the earth and the crops with oil and chemicals." Gutierrez says the chemical-laden water forced his family out of agriculture. They sold the farm piece by piece to developers. Gutierrez now works in construction and his brother drives a taxi. On the United States side, farmers also stand in the way of urban water plans, and here, they hold the trump card. This section of the Rio Grande, like most, is plumbed for irrigation. One hundred miles north of El Paso in southern New Mexico, irrigators use the Elephant Butte and Caballo dams as giant spigots. Each winter, they turn the river off completely, storing water in reservoirs behind the dams. Come spring, they open the floodgates, pouring 759,000 acre-feet of Rio Grande water each year into the agricultural valleys of southern New Mexico and west Texas. El Paso owns rights to some of that water and leases another slug of it from farmers. But irrigators still control the dam, so El Paso can only get river water from mid-February to October. Now, the city wants river water year-round, and relations between the city and irrigators are notoriously tense. In mid-January, it looked like a truce was possible: Working under the Texas-New Mexico Water Commission, irrigators agreed to give water year-round to El Paso. The $350 million El Paso-Las Cruces Regional Sustainable Water Project would send water to a new treatment plant, and from there, through a 32-mile aqueduct to El Paso. But before the ink had even dried on the plan, the city sued El Paso Irrigation District #1. The suit said the district had failed to deliver El Paso's current allotment of river water, which the district sells at the low rate of $15 per acre-foot. The irrigation district countersued, accusing El Paso of planning to drill shallow wells along the river to steal water that belongs to the farmers. The lawsuits have since been dropped, but the regional water project is in limbo. There are 35,000 landowners in the El Paso #1 district, 30,000 of whom irrigate less than two acres; they are protective of their dab of water, and the green surroundings it provides them in the desert. "There may be a time when agriculture does fizzle out, and at that point maybe the water should be committed for municipal use," says Lisa Power, an attorney for El Paso #1. "But as a resident here, there's a beauty to having the river there and farmland. It adds to quality of life." Those who are willing to let their fields lie fallow and lease water to El Paso want to wring out every drop of money they can. The irrigation district is now asking El Paso to pay $193 per acre-foot of additional water next year, an amount that would rise to $260 by 2020. Many farmers are holding out for even more, says Power. "Who knows how much water will be worth in a number of years?" Frustrated by this attitude, the price hikes and political scuffles, El Paso is looking at its other options, including cleaning deep aquifer water with a desalination plant. Ironically, the transfer of water from farmers to Juarez and El Paso holds a seed of ecological hope for the Rio Grande. As long as most of the river's water is in the hands of farmers, the Rio Grande will be turned off like a tap each winter, says Kevin Bixby, executive director of the Southwest Environmental Center in Las Cruces, N.M. But if the cities can buy water year-round, the river between Elephant Butte Dam and El Paso will have water 12 months a year for the first time since 1916, when the dam was finished. "People who grew up around here remember the Rio Grande having trees along its banks," says Bixby, who has been fighting for six years to restore this stretch of the river. "(Spanish explorer Juan de) Onate spent the first Thanksgiving in the New World on the river near Juarez. He described the river as an oasis of ducks, fish, trees, geese ..."
Now, between Elephant Butte Dam and El Paso, the river is more canal than river. The International Boundary and Water Commission, which manages the river here, calls it the "Canalization Project," not the Rio Grande. The commission has gone so far as to clear-cut the riverside bosque, mowing plants to no higher than a foot in the name of flood prevention; it argues that flood debris caught in vegetation could create temporary dams, flooding fields and homes and taking out bridges. Convincing water users of the value of river restoration has been difficult, says Bixby. Farther up the Rio Grande, environmentalists and wildlife managers have used endangered species such as the silvery minnow to force farmers and federal agencies to keep water in the river. But here, where the river runs nearly dry for three months of the year, no endangered fish survive. "We're the fly on the back of the elephant," says Bixby, "but we don't have the mahout stick to make the elephant move * we don't have the Endangered Species Act." The Sustainable Water Project, however, offers a different hook. The Fish and Wildlife Coordination Act requires federal agencies to consult with the U.S. Fish and Wildlife Service when embarking on a project of this scale. Agencies must not only avoid further damaging wildlife resources, but also pay as much attention to wildlife as to development. In a lengthy analysis, the Fish and Wildlife Service asked the New Mexico-Texas Water Commission to restore portions of the Rio Grande to a more natural state. While the commission balked at some of the recommendations, it has agreed to restore fish habitat and wetlands, retire farmland and replant it with native plants, and even allow the cottonwood bosque to grow back in places. "It's a modest step forward," says Bixby, who is concerned that the project could still leave portions of the river dry. "The only way to get water (for the Rio Grande) is to buy it, and that's going to cost a fortune. If we can piggyback on El Paso's water, that's a good thing." Another good thing is in the works, Bixby says: For the first time, the International Boundary and Water Commission is doing a full environmental impact statement on the canalization project. Doug Echlin, Environmental Protection Specialist for the commission, says the agency is looking at the possibility of restoring natural meanders and flooding, and has already begun replanting the native bosque in places. "For many years, it was pretty much, 'mow everything in sight' out there," he says. "Now we're planting cottonwoods and willows in the floodway." Not everyone welcomes the changes, he adds. "Whenever we plant, we get questions from farmers. 'Whose water are you going to be using? You know those trees will be drinking water that belongs to the district?'" Bixby acknowledges that any progress for the river will be hard fought. "This is a classic case study of the challenge of environmental restoration in the modern world," he says. "You have a huge human population, a rising demand for resources and a degraded ecosystem. How can you accomplish restoration in this context?" The answer depends on cooperation between two states, two countries, two booming border cities, several thousand farmers, and more water lawyers than you could pack into the El Paso County courthouse. Still, there are signs that these people are beginning to work together. "We can't think about water issues in El Paso without thinking about Ciudad Juarez," says Doug Echlin. "There's just a sliver of river between us and them." Megan Lardner is a graduate student in journalism at the University of California, Berkeley. HCN associate editor Greg Hanscom contributed to this report. This story is part of a series on the Rio Grande funded by the McCune Foundation. Find the entire "Imagine a River" series online. Carol Parker, El Paso Public Service Board, P.O. Box 511, El Paso, TX 79961 (915/594-5692).